Richardson’s Hobart Harley-Davidson opened in November 2011 and has been supported by many local people, we have created some great and long lasting customers and friends at the store, which we hope to keep and continue to grow in the future as customers of our Launceston store. Due to the declining motorcycle sales worldwide for all brands including Harley-Davidson a decision has been made to relocate Richardson’s Hobart Harley-Davidson back to Launceston and close our Elizabeth Street Store, it is with a heavy heart we announce this, a lot of thought has gone into the decision for the relocation. What does this mean for you, our Hobart customers? 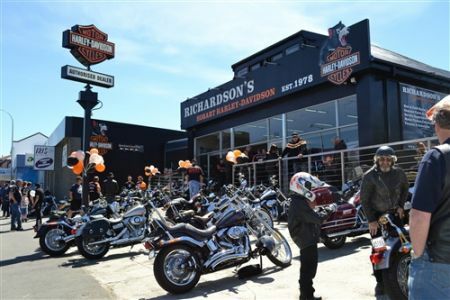 Richardson’s Harley-Davidson Launceston will be providing the same great service for our Southern customers as we did before we established the Hobart store in 2011 - providing a pick up and return service for all service work once weekly returning the motorcycle the following week. Merchandise and parts order can be placed through the Launceston store and will be posted directly to customers. Between now and the closing date there will be 30% off all Parts, Accessories and Merchandise for all our customer in the Hobart area. Our last trading day will be Saturday the 13th of April closing at 3 pm. We wish to say a sincere thanks to all our customer for your valued support in Hobart and we hope to be assisting you into the future delivering you the best customer service from our Launceston Dealership, we hope to see you all in store and at our next events in Launceston. We invite all our Hobart Hogs and valued customers to a final HOG Hill BBQ on Friday April 12th as a thank you for your support at our Hobart store. Thank you from myself and the entire Team at Richardson’s Hobart Harley-Davidson.